Transcranial magnetic stimulation (TMS) has potential to treat various neurological disorders noninvasively and safely. 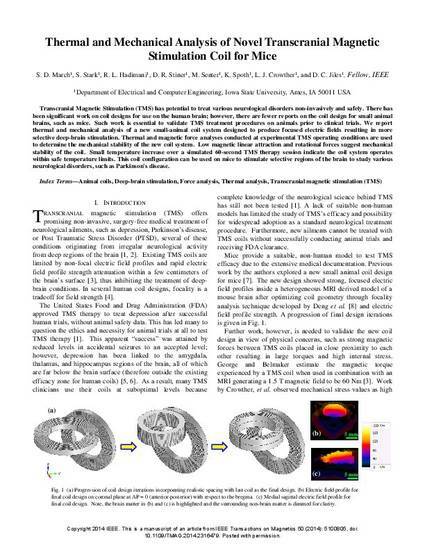 There has been significant work on coil designs for use on the human brain; however, there are fewer reports on the coil design for small animal brains, such as mice. Such work is essential to validate TMS treatment procedures on animals prior to clinical trials. We report thermal and mechanical analysis of a new small-animal coil system designed to produce focused electric fields resulting in more selective deep-brain stimulation. Thermal and magnetic force analyses conducted at experimental TMS operating conditions are used to determine the mechanical stability of the new coil system. Low magnetic linear attraction and rotational forces suggest mechanical stability of the coil. Small temperature increase over a simulated 60 s TMS therapy session indicates that the coil system operates within safe temperature limits. This coil configuration can be used on mice to stimulate selective regions of the brain to study various neurological disorders, such as Parkinson's disease. Copyright 2014 IEEE. This is a manuscript of an article from IEEE Transactions on Magnetics 50 (2014): 5100805, doi: 10.1109/TMAG.2014.2316479. Posted with permission.